Voilá! Here’s yet another batch of bad comics, and if I may say so myself, I think this one’s the worst one yet! Scroll down further to see the previous New Years batch. Also, as per usual, click on the image to zoom in. Oh, and a proper new strip will most likely appear later this week. The last one requires you to know what “camper” means in a video game. I like it. I actually don’t get the hot air balloons one, but I have some guesses. Oh, maybe I get the last one then. Not sure, though, I should have more alcohol, and think about it later. For the last one, I understood it in the following way: the middle balloon farted, thus producing methane, thus getting lighter compared to air. Those were indeed bad, in a bad comics sort of way. .. hot air balloons are propelled by gas. it passed gas. Hmm. 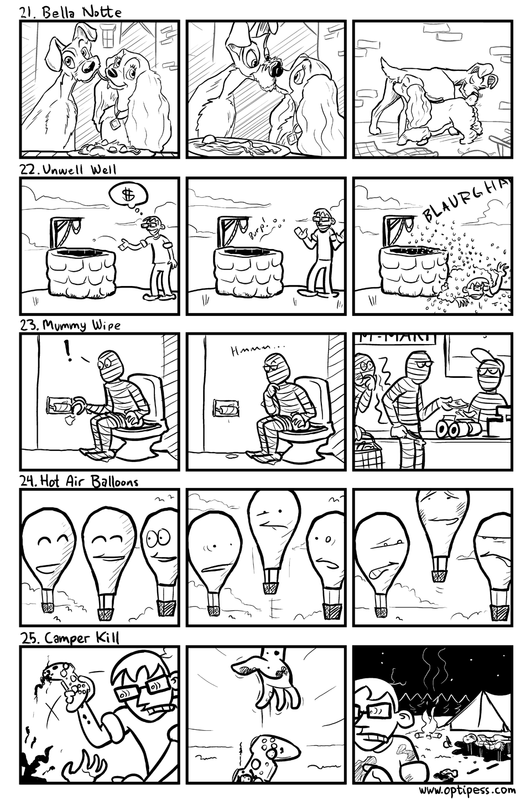 The comic seemed to imply that the balloon released gas, but had that been the case, shouldn’t it have gone downwards if it’s the gas inside the balloon that makes it go upwards? Less gas inside should equal lower altitude.